One of the many standout characters in Star Wars: The Last Jedi was General Armitage Hux, portrayed by Domhnall Gleeson. 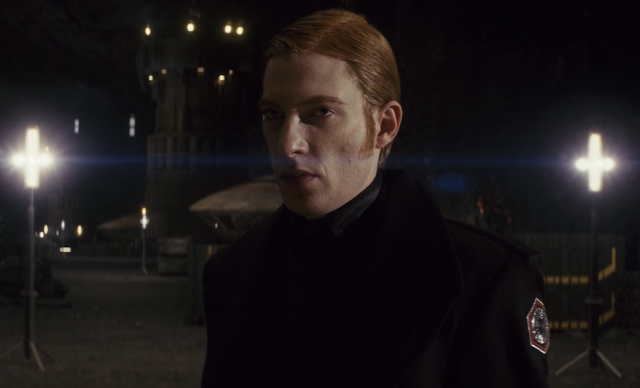 Caught between the tracking down the remnants of the Resistance and a massive change of leadership within the First Order, Hux's story was filled with twists and turns in Episode VIII. Gleeson, while promoting his newest film, Peter Rabbit, spoke with Radio Times about his character's continued involvement in the second chapter of the Sequel Trilogy, as well as what he expects from Episode IX. “What was brilliant [about The Last Jedi] was that it was unexpected... And I’ve got a feeling that what JJ does may also be unexpected." “I wasn’t expecting [Hux’s comedy] to be the way it went in VIII, at all. It really surprised me. And I’d say rather than played for laughs, it was written for laughs. We did it with an eye on the comic elements of it... It worked in a completely different way to how it worked in the previous film, and I think that’s really cool... It takes real imagination and confidence to see what happened before – I mean JJ knocked it out of the park with VII – then have the confidence to say ‘I’m not just going to copy what JJ did, I’m going to develop my own thing.’ I just thought that was fantastic." The humor involving Hux, especially the opening "General Hugs" scene, has unfortunately been a sore spot for a lot of fans. Love it or hate it, Gleeson's character definitely ended up being the source of a lot of the film's big laughs. I, for one, am intrigued and excited to see where Abrams takes Hux in Episode IX. Given his obvious disdain for Kylo Ren, it will be interesting to see if the General might attempt to overthrow the new Supreme Leader, and how it might affect the fate of the First Order. Star Wars: The Last Jedi is out now Digital HD, and hits Blu-ray and 4K Ultra on Tuesday. Star Wars: Episode IX opens in theaters on December 20th, 2019.